The graph shows the results for the unadjusted analyses, analyses adjusted for psychiatric indications, and analyses adjusted for all potential confounders by exposure groups using Medicaid data from 2000 to 2010. Centers for Medicare & Medicaid Services. Medicaid Analytic Extract (MAX) general information: MAX 1999-2005 state claims anomalies from the “2005 Files” zipped file within the MAX Data 2005 to 2008 General Information, Data Dictionaries, Data Element Lists, Data Anomalies, Validation Table Measures and SAS Loads zipped file. https://www.cms.gov/Research-Statistics-Data-and-Systems/Computer-Data-and-Systems/MedicaidDataSourcesGenInfo/MAXGeneralInformation.html. Accessed December 22, 2014. Importance The frequency of antipsychotic (AP) use during pregnancy has approximately doubled during the last decade. However, little is known about their safety for the developing fetus, and concerns have been raised about a potential association with congenital malformations. Objective To examine the risk for congenital malformations overall and cardiac malformations associated with first-trimester exposure to APs. Design, Setting, and Participants This nationwide sample of 1 360 101 pregnant women enrolled in Medicaid with a live-born infant constituted the pregnancy cohort nested in the Medicaid Analytic Extract database, which included data from January 1, 2000, to December 31, 2010. Participants were enrolled in Medicaid from 3 months before their last menstrual period through at least 1 month after delivery. Relative risks (RRs) were estimated using generalized linear models with fine stratification on the propensity score to control for the underlying psychiatric disorders and other potential confounders. Data were analyzed during 2015. Exposures Use of APs during the first trimester, the etiologically relevant period for organogenesis. Main Outcomes and Measures Major congenital malformations overall and cardiac malformations identified during the first 90 days after delivery. Results Of the 1 341 715 pregnancies that met inclusion criteria (mean [SD] age of women, 24.02 [5.77] years), 9258 (0.69%) filled at least 1 prescription for an atypical AP and 733 (0.05%) filled at least 1 prescription for a typical AP during the first trimester. Overall, 32.7 (95% CI, 32.4-33.0) per 1000 births not exposed to APs were diagnosed with congenital malformations compared with 44.5 (95% CI, 40.5-48.9) per 1000 births exposed to atypical and 38.2 (95% CI, 26.6-54.7) per 1000 births exposed to typical APs. Unadjusted analyses suggested an increased risk for malformations overall for atypical APs (RR, 1.36; 95% CI, 1.24-1.50) but not for typical APs (RR, 1.17; 95% CI, 0.81-1.68). After confounding adjustment, the RR was reduced to 1.05 (95% CI, 0.96-1.16) for atypical APs and 0.90 (95% CI, 0.62-1.31) for typical APs. The findings for cardiac malformations were similar. For the individual agents examined, a small increased risk in overall malformations (RR, 1.26; 95% CI, 1.02-1.56) and cardiac malformations (RR, 1.26; 95% CI, 0.88-1.81) was found for risperidone that was independent of measured confounders. Conclusions and Relevance Evidence from this large study suggests that use of APs early in pregnancy generally does not meaningfully increase the risk for congenital malformations overall or cardiac malformations in particular. The small increase in the risk for malformations observed with risperidone requires additional study. Since the first systematic review on this topic,3 clinicians continue to have very little information regarding the safety of these drugs for the developing fetus despite the growing use of atypical APs. Registry studies have been small (<250 exposed women) and have yielded mixed results; one study4 reported higher than expected rates of malformations (particularly cardiac), whereas another study5 did not find this association. Results from epidemiologic studies have also yielded inconsistent evidence. The 2 largest epidemiologic studies available to date—which included 570 and 561 exposed women6,7—reported a 1.5- to 2-fold increase in the risk for congenital malformations, in particular atrial and ventricular septal defects. Another study based on 151 exposed women1 suggested that atypical APs are not associated with an increased risk for major malformations. However, this study was underpowered to detect a less than 5-fold increase in risk. 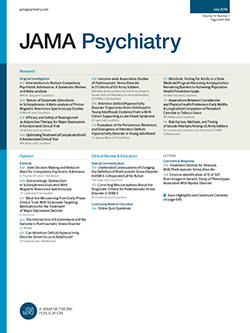 Given the need for additional information to enable psychiatrists and their patients to weigh the risks of using these medications during early pregnancy, our objective was to examine the risk for congenital malformations, and in particular cardiac malformations, associated with first-trimester exposure to different APs in a large cohort. Question Does the use of antipsychotics during pregnancy increase the risk for congenital malformations? Findings In this cohort study of 1.3 million pregnant women, after accounting for psychiatric conditions and other potential confounding variables, no increased risk for congenital malformations was found for typical or atypical antipsychotics, with a possible exception for risperidone. Meaning These findings suggest that antipsychotics have no important teratogenic effects; the initial safety signal for risperidone requires further study. We used the pregnancy cohort nested in the nationwide Medicaid Analytic Extract database, which included data from January 1, 2000, to December 31, 2010. The Medicaid Analytic Extract data include demographic and insurance enrollment information, medical visits and hospitalizations, inpatient and outpatient diagnoses and procedures, and prescriptions filled on an outpatient basis. The development of this cohort has been described in detail elsewhere.8 The cohort consisted of all pregnancies that resulted in live births for which Medicaid covered the health care expenses. Women and girls aged 12 to 55 years (hereinafter referred to as women) were required to have coverage through Medicaid from 3 months before the date of their last menstrual period (start of pregnancy) to 1 month after delivery. Infants were required to have coverage through Medicaid for the first 3 months of life unless they died sooner. Pregnancies with exposure to a known teratogenic medication during the first trimester (n = 8246) and pregnancies with a chromosomal abnormality (n = 2550) were excluded. This study was approved by the institutional review board of Brigham and Women’s Hospital, which waived the need for informed consent. Exposure to AP was defined based on filling at least 1 prescription during the first 90 days of pregnancy (first trimester), which is considered the etiologically relevant period for organogenesis. We evaluated typical and atypical APs (eTable 1 in the Supplement) as 2 separate classes, as well as the most frequently used individual medications, including aripiprazole, olanzapine, quetiapine fumarate, risperidone, and ziprasidone. Women were considered unexposed if they did not fill an AP prescription during the 3 months before the start of pregnancy or during the first trimester. The presence of congenital malformations was defined on the basis of inpatient or outpatient diagnoses and procedure codes from the International Classification of Diseases, Ninth Revision (ICD-9) in the maternal (first month after delivery) or infant (first 3 months after date of birth) record. The maternal record was considered because Medicaid claims are sometimes recorded under the mother before the infant’s eligibility has been processed.9 We defined 13 specific malformation groups (central nervous system, ear, eye, cardiovascular, other vascular, respiratory, oral cleft, gastrointestinal tract, genital, urinary, musculoskeletal, limb, or other) and considered a malformation to be present if (1) an ICD-9 diagnosis was recorded for the specific malformation on more than 1 date, (2) a diagnosis was recorded on 1 date as well as a relevant surgery or procedure code, or (3) a diagnosis was recorded on 1 date and the infant died before 90 days. If the malformation was identified using codes from the maternal record only and these codes were also present during the first 105 days of pregnancy, the outcome was excluded under the assumption that it reflects a preexisting malformation in the mother. An infant was considered to have a major congenital malformation if any of the 13 specific malformations were present. Because of earlier findings of a possible increased risk,4,6,7 we evaluated the risk for cardiac malformations separately (eTable 2 in the Supplement). Data were analyzed in 2015. Baseline characteristics were assessed in women treated and not treated with the various APs, and balance was assessed using the standardized mean difference. We calculated absolute risks for any congenital malformation and for cardiac malformations and unadjusted relative risks (RRs) with their 95% CIs. Use of the robust variance estimator to account for correlations within women with multiple pregnancies did not appreciably change the CIs, so correlation structures were omitted from all analyses. In the first adjusted analysis, we accounted for psychiatric and neurologic conditions and the use of other psychotropic medications to adjust for the possible confounding effect of the underlying disease and its associated factors. In the second adjusted analysis, we accounted for all potential confounding variables described earlier. Given the large number of covariates considered, propensity scores (PS)—estimated using logistic regression—were used as a data reduction technique. We trimmed the cohort by excluding observations from the nonoverlapping regions of the PS distributions and created 50 equal-sized PS strata based on the distribution among the treated women.12 In the outcome models, the untreated observations were weighted using the distribution of the treated women among PS strata. Adjusted RRs were estimated using generalized linear models (PROC GENMOD [SAS Institute Inc] with a weight statement and loglink function). Exploratory analyses were conducted to further test potential safety signals emerging from the study. We adjusted for high-dimensional PS in the analyses in which exposure was defined based on filling at least 2 prescriptions. We compared the risk for malformations between women who were treated with APs during the 3 months before the start of pregnancy and continued treatment during the first trimester (continuers) and women who discontinued treatment before the first trimester (discontinuers). The rationale for this analysis is that discontinuers might be more comparable to continuers than women who were never treated with APs. We increased the length of the gap between the last prescription fill and the start of pregnancy for the discontinuers (0, 4, 6, and 8 weeks) to reduce the likelihood of misclassifying as unexposed any women who still had medication from their last fill available to consume early in pregnancy. All analyses were conducted using the SAS System for Unix (version 9.3; SAS Institute Inc). The study cohort included 1 341 715 pregnancies (mean [SD] age of women, 24.02 [5.77] years) who met the inclusion criteria (eFigure 2 in the Supplement). Among those, 9258 women (0.69%) filled a prescription for an atypical AP during the first trimester, and 733 women (0.05%) filled a prescription for a typical AP. The most frequently used atypical AP was quetiapine (n = 4221), followed by aripiprazole (n = 1756), risperidone (n = 1566), olanzapine (n = 1394), and ziprasidone (n = 697). A total of 1 331 910 women had no AP dispensed from 3 months before the start of pregnancy through the end of the first trimester. Women taking APs during the first trimester were older, more likely to be white, and more likely to deliver prematurely. They had a much higher burden of comorbid illness than untreated women as judged by the differences in baseline characteristics. They had more psychiatric and neurologic conditions and other comorbid conditions, used more psychotropic medications and suspected teratogens, and were generally in poorer health. These patterns were observed for atypical and typical APs and for each of the individual atypical agents (Table 1 and Table 2 and eTables 3-9 in the Supplement). The absolute risks for congenital malformations overall per 1000 live-born infants were higher among treated women, with 38.2 (95% CI, 26.6-54.7) for those treated with typical APs and 44.5 (95% CI, 40.5-48.9) for those treated with atypical APs vs 32.7 (95% CI, 32.4-33.0) for untreated women. Higher risks were also observed for women treated with all individual atypical medications, ranging between 37.3 and 51.1 per 1000. Likewise, increased risks for cardiac malformations were observed for all AP exposures (Table 3). Unadjusted analyses suggested a significantly increased risk for malformations overall for atypical APs (RR, 1.36; 95% CI, 1.24-1.50) and for the individual agents within that class with the exception of ziprasidone (Figure 1A and eTable 10 in the Supplement). The findings for cardiac malformations were similar, but the effects were less precisely estimated (Figure 2A and eTable 10 in the Supplement). A small, nonsignificant increase in the unadjusted risk was seen for typical APs (RR for overall malformations, 1.17 [95% CI, 0.81-1.68]; RR for cardiac malformations, 1.18 [95% CI, 0.64-2.18]). These associations were attenuated when we adjusted for psychiatric indications, but the risk for malformations overall, although small, remained significantly increased for atypical APs (RR, 1.12; 95% CI, 1.02-1.23), with the largest increase seen for risperidone (RR, 1.31; 95% CI, 1.05-1.63) (Figure 1B). The corresponding RRs for cardiac malformations were 1.15 (95% CI, 0.98-1.35) and 1.39 (95% CI, 0.96-2.01) for atypical APs and risperidone, respectively (Figure 2B and eTable 10 in the Supplement). The AP-treated and untreated populations were well balanced in terms of baseline characteristics once we accounted for all potential confounding variables and their proxies, as evidenced by the absolute value of the standardized differences less than 0.1 (Tables 1 and 2). In this fully adjusted analysis, the RR further shifted to the null for atypical APs for malformations overall (RR, 1.05; 95% CI, 0.96-1.16) and for cardiac malformations (RR, 1.06; 95% CI, 0.90-1.24). In contrast, the risk remained elevated for risperidone for overall malformations (RR, 1.26; 95% CI, 1.02-1.56) and cardiac malformations (RR, 1.26; 95% CI, 0.88-1.81). None of the other medications were associated with an increased risk (Figures 1C and 2C and eTable 10 in the Supplement). Use of the high-dimensional PS and restriction to women with schizophrenia, bipolar disorder, or psychosis did not affect the findings, but the associations were less precisely estimated in the restricted analyses (eTable 11 in the Supplement). Redefining exposure as having filled at least 2 prescriptions for an AP or having at least a 1-day supply that overlapped with the first trimester also did not meaningfully change the results, although the association appeared to strengthen somewhat for risperidone in analyses based on filling at least 2 prescriptions (RR for any malformation, 1.46 [95% CI, 1.01-2.10]; RR for cardiac malformations, 1.87 [95% CI, 1.09-3.19]). Restricting the outcome definition to malformation codes in the infant’s record only did not alter the results (eTable 12 in the Supplement). We found no evidence of a dose-response relationship for any of the individual APs except for risperidone. Dosages of at least 2 mg/d were associated with an increased risk for cardiac malformation (RR, 2.08; 95% CI, 1.32-3.28) (eTable 13 in the Supplement). The RR for any congenital malformation associated with atypical AP use increased from 1.05 to 1.09 and 1.14 after accounting for potential differences in the probability of termination of malformed fetuses among treated and untreated women, respectively, using the best estimates based on the literature (eResults in the Supplement). Adjusting for the high-dimensional PS in analyses in which exposure was defined based on filling at least 2 prescriptions for risperidone did not attenuate the associations (eTable 14 in the Supplement). Finally, comparing risperidone continuers with discontinuers, the strength of the association between risperidone continuation and congenital malformations was null without a gap between the last prescription fill and the start of pregnancy for the discontinuers but increased in a monotonic manner when defining discontinuation with increasing levels of strictness (eTable 15 in the Supplement). We examined the association between AP use during the first trimester of pregnancy and the risk for congenital malformations overall and cardiac malformations in a cohort of 1 341 715 Medicaid-insured women. We did not observe a significant increased risk for either outcome for typical or atypical APs after controlling for potential confounding by mental and physical comorbid conditions and their associated behaviors, with the exception of risperidone. The small increase in absolute risk and RR for malformations observed with risperidone should be interpreted with caution because no apparent biological mechanism can readily explain this outcome, and the possibility of a chance finding cannot be ruled out. This finding should therefore be interpreted as a potential safety signal that will require follow-up in other studies, which also should attend carefully to confounding and have adequate statistical power. Ennis and Damkier15 reported an unadjusted RR of 1.5 (95% CI, 0.9-2.2) for risperidone for major congenital malformations based on a systematic review of the evidence available through May 2014 (432 exposed pregnancies). Although this estimate is similar to our unadjusted estimate (RR, 1.56), it is based on a population reference value with no confounding control. The extent to which this association can be attributed to confounding is therefore not known. Our study has several strengths, including its large size. Our cohort included 9258 women exposed to an atypical AP during the first trimester compared with 570 in the largest study available to date.6 This number enabled us to assess the risks associated with individual agents. The richness of the source data allowed for careful control of potential confounders through the use of PS methods, including more than 50 variables in conventional analyses and more than 250 variables in high-dimensional PS analyses. The study limitations are those characteristic of studies that use large health care utilization databases or nationwide registries and center around the potential for misclassification and selection bias. To guard against exposure misclassification (ie, false-positives), we favored specificity over sensitivity in our primary exposure definition, which required women to have filled a prescription during the first trimester. Requiring women to have filled at least 2 prescriptions under the assumption that filling multiple prescriptions increases the likelihood that the medication is being taken as prescribed did not affect the conclusions. However, neither of these definitions guarantees that the medication was actually—although likely—consumed during the first trimester. No risk for recall bias exists given the data source used, and no risk for false-negatives given that APs are not available over the counter. Similarly, we used a highly specific outcome definition because this will result in an unbiased estimate of the RR as long as the sensitivity is nondifferential. Using this definition, the risks among the unexposed were in line with expectations given the known prevalence of congenital malformations, and we previously reproduced the known associations between diabetes and overall and organ-specific malformations.16 Moreover, the definition for cardiac malformations has previously been validated.17 The absence of a validation study for the noncardiac malformations is a limitation, however. Potential confounding by variables incompletely or not captured in the data source (eg, smoking, obesity, alcohol or other drug abuse or dependance, or body mass index) is not a major concern given our null findings. Whereas residual confounding could theoretically be an explanation for the increased risk observed with risperidone, it is unlikely to affect the findings for risperidone but not for other agents. Finally, a potential for selection bias exists because the cohort was restricted to live births. Spontaneous abortions, stillbirths, or planned terminations owing to congenital malformations diagnosed early in pregnancy would therefore be missed. Previous studies1,7 have documented that the rate of therapeutic abortions may be 10% to 20% higher among AP users. The quantitative bias analysis that assessed the potential impact of such missed terminations suggested that selection bias is not a major explanatory factor for our findings. Whenever possible, given incomplete knowledge regarding the reproductive safety profiles of many pharmacologic agents, medications should be avoided during pregnancy. However, frequently avoidance is not possible, as is the case for women with schizophrenia, bipolar disorder, or major depressive disorder, in which few alternative treatment options are available. Our findings suggest that use of APs early in pregnancy does not meaningfully increase the risk for congenital malformation or cardiac malformation, with the possible exception of risperidone. The findings for risperidone should be viewed as an initial safety signal that will require confirmation in other studies. Corresponding Author: Krista F. Huybrechts, MS, PhD, Division of Pharmacoepidemiology and Pharmacoeconomics, Department of Medicine, Brigham and Women’s Hospital and Harvard Medical School, 1620 Tremont St, Ste 3030, Boston, MA 02120 (khuybrechts@bwh.harvard.edu). Accepted for Publication: May 19, 2016. Published Online: August 17, 2016. doi:10.1001/jamapsychiatry.2016.1520. Author Contributions: Dr Huybrechts had full access to all the data in the study and takes responsibility for the integrity of the data and the accuracy of the data analysis. Study concept and design: Huybrechts, Hernández-Díaz, Patorno, Desai, J. M. Cohen, L. Cohen, Bateman. Drafting of the manuscript: Huybrechts, Hernández-Díaz, Patorno, Dejene, Bateman. Statistical analysis: Huybrechts, Hernández-Díaz, Patorno, Desai, Mogun, Bateman. Administrative, technical, or material support: Huybrechts, Hernández-Díaz, Mogun, Dejene, J. M. Cohen, Panchaud. Study supervision: Huybrechts, Hernández-Díaz, Bateman. Conflict of Interest Disclosures: Dr Hernández-Díaz reports consulting for AstraZeneca and UCB for unrelated topics. Dr L. Cohen reports receiving grant support from AstraZeneca Pharmaceuticals, Alkermes, Bristol-Myers Squibb/Otsuka, Sunovion Pharmaceuticals, Inc, Bayer HealthCare Pharmaceuticals, Ortho-McNeil Janssen Pharmaceuticals, Inc, Pfizer, Inc, Forest Laboratories, Inc, Cephalon, Inc, GlaxoSmithKline, Takeda/Lundbeck, National Institute on Aging, National Institutes of Health, and National Institute of Mental Health (NIMH) and personal fees for consultancy from JDS Therapeutics LLC, Noven Pharmaceuticals, and PamLab LLC. No other disclosures were reported. Funding/Support: This study was supported by grant R01 MH100216 from the NIMH, career development grant K01MH099141 from the NIMH (Dr Huybrechts), career development grant K08HD075831 from the National Institute of Child Health and Human Development (Dr Bateman), and grant P3SMP3-158808/1 from the Swiss National Science Foundation (Dr Panchaud). Role of the Funder/Sponsor: The funding sources had no role in the design and conduct of the study; collection, management, analysis, and interpretation of the data; preparation, review, or approval of the manuscript; and decision to submit the manuscript for publication.